The winds are crazy here in Dallas with red flag alerts. This is bad for brush fires but good if you are interested in flying a kite!! I guess not literally. Are you interested in winning some great prizes? and Accuquilt’s facebook Fan page. stop to be entered for some super prizes. 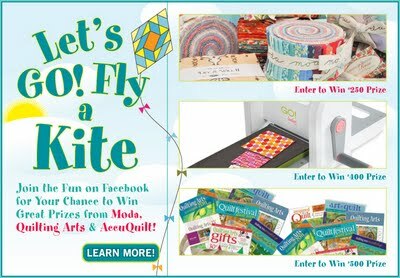 If you win you will be so excited it will be hard to keep your feet on the ground, holding a kite or not! We're having those winds here south of San Antonio, too. I hate that the wind is HOT!!! We could use cool breezes instead. We are having record winds down the road in Arlington, too, LOL! !